Coiled Tubing is a continuous length of steel or complex tubing that is flexible enough to be rolled on and welded which is adapted for the Oil and Gas exploration applications which provides sufficient rigidity, strength and effective execution of down hole operations. The global Coiled Tubing market in 2017 is valued at $43.67 billion and is anticipated to $56.22 billion by 2023 growing at an estimated value of CAGR of more than 4.3% during the forecast period 2018 to 2023. 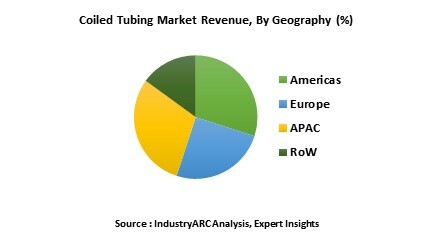 North America will dominate the Coiled Tubing Market in the upcoming years with a share of approximately 46.6% in 2017 and generating a revenue of $ 1.94 billion in 2017. It will generate revenue of $2.06 billion by 2023 at a CAGR of 3.63%. Coiled Tubing Market is segmented by service, operation, application and end user. On the basis of Service, the Coiled Tubing Market is segmented in to Well Intervention, drilling, pressure pumping service, nitrogen services and others. Drilling segment is estimated to have faster growth rate followed by well intervention and production segment because of the rapid increasing drilling activities especially in Middle East countries. On the basis of operations, the Coiled Tubing market is categorized in to Circulation, Pumping, Logging, Perforation, Milling and others. Circulation operational segment is expected to be the fastest-growing segment over the forecast period. On the basis of application, the Coiled Tubing market is segmented in to Wellbore Cleanouts, Electrical Submersible Pump Cable Conduit, Fracturing, Pipeline Cleanout, Fishing, Cementing, Nitrogen Jetting, acid stimulation and others. On the basis of end user, the coiled tubing market is segmented in to Oil and Gas Industry, Engineering Procurement and Construction and etc. The global Coiled tubing market is set to experience a substantial growh owing to the strong demand from Oil & Gas segment across the worldwide. The average selling price of coiled tubing unit for well intervention and production was $2.8 million in 2017 and is estimated to witness negative growth in the coming future and reach $ 2.4 million by 2023. The major growth drivers that impact the Coiled Tubing market are new and unconventional hydrocarbons recovery, escalating demand for energy and renewable resources, continuous increasing focus on natural gas production to drive the market as coiled tubing services are used to enhance both oil and natural gas production. The major challenge faced by the service providers of Coiled Tubing market is declining oil prices and increase in the length of horizontal wells which hamper the market growth. The Stringent rules and regulations across the world concerning oil and gas leaks, water contamination, environment and public health are the significant challenges experienced by Coiled Tubing market. The base year of the study is 2017, with forecast done up to 2023. The study presents a thorough analysis of the competitive landscape, taking into account the market shares of the leading companies. It also provides information on unit shipments. These provide the key market participants with the necessary business intelligence and help them understand the future of the Coiled Tubing Market. The assessment includes the forecast, an overview of the competitive structure, the market shares of the competitors, as well as the market trends, market demands, market drivers, market challenges, and product analysis. The market drivers and restraints have been assessed to fathom their impact over the forecast period. This report further identifies the key opportunities for growth while also detailing the key challenges and possible threats. The key areas of focus include the types of plastics in the electric vehicle market, and their specific applications in different types of vehicles. Coiled Tubing Market– By Service: Well Intervention & Production, Drilling, Perforating, Fracturing, Engineering Services, Milling Services, Nitrogen services and others. Coiled Tubing Market - By Operation: Circulation, Pumping, Logging, Perforation, Milling and Others. Coiled Tubing Market- By Location: On-Shore, Off-Shore. Coiled Tubing Market – By Application: Wellbore Cleanouts, Electrical Submersible Pump Cable Conduit, Fracturing, Pipeline Cleanout, Fishing, Cementing, Nitrogen Jetting and others. Coiled Tubing Market – By End user: Oil and Gas Industry, Engineering Procurement and Construction Industry and others. Some of the Key players in this market that have been studied for this report include Halliburton Co, Baker Hughes Inc., Weatherford International, Superior Energy Services Inc., Nabors Industries, Archer Limited, C&J Energy Services, Trican Well Services Ltd, Calfrac Well Services Ltd and RPC, Inc. among others. In November 2018, Baker Hughes, a GE company (NYSE: BHGE) announces the launch of its new approach to subsea development, Subsea Connect, including its Aptara™ TOTEX-lite subsea system, a suite of new lightweight, modular technologies designed for the full life of field. By combining planning and risk management, new modular deep-water technology, innovative partnerships and digital tools into a single offering, Subsea Connect can reduce the economic development point of subsea projects by an average of 30 percent and has the potential to unlock an additional 16 billion barrels of reserves globally. In November 2018, Schlumberger introduced Concert* well testing live performance technology at the Abu Dhabi International Petroleum Exhibition & Conference. The new technology brings real-time surface and down hole measurements, data analysis, and collaboration capabilities to well testing. National Oil well Varco has developed Coiled tubing support pumps which is used for pumping pressures operations in oilfields. Trailer Mounted Coiled Tubing Support Pump gives multiple material options for fluid systems such as stainless steel, coatings etc. It has got large climate controlled control cabins with redundant systems for operator comfort. The pumps are lower cost alternatives that save up the initial amount invested. Also, their shorter wheelbase and lower weight make them ideal for older well-sites built on back roads with small pads. These units can be easily customized to work with any situation. 15.5. Superior Energy Services Inc.